Starting a Business - Darrington Strong, Inc. So you want to start a Darrington area business? Darrington Strong supports local businesses & believes shopping local is essential for a strong economy! Maybe your dream is to sell farm goods from your garden, make a value added product such as jam in your own kitchen or furniture from local natural resources. The first step is to set up a solid plan and there may be more help to do this than you realize. This is a good time to discover your library all over again, they are open for business and ready to help you. Whether you are a new business or an established business, think of them as a partner to your road of success! How will you move your product? How much profit will you need to both cover your cost and pay a profit back to you? First evaluate the idea, product or business, second identify the strategy, tools and resources needed to build it, third how to launch you product successfully. Checkout Buildit Northwest for assistance & mentoring when starting a product based business. The Small Business Administration is here to help walk you trough creating your business plan. How will you market your business? You want to market your business locally as well as get the word out far beyond your community. See where your community is already spending their money with the Consumer Expenditure Index. Our projected retail sales can be very positively impacted by understanding the importance of shopping locally, local jobs and growing local businesses and local products. It is also useful to understand the demography of your community. Having a look at administering your business, yes we're talking about the paperwork and taxes associated with running a business. You will also be glad to know that SCORE, a volunteer based Snohomish County nonprofit is here to help you! SCORE is here to help you write your business plan, marketing strategies and more. To set up your business you will need to open an account with the Washington State Department of Revenue which can be done online and is pretty self explanatory. The Washington State HUB will help you with a good focused marketing plan, understanding financing and more. There is a lot of support available for starting a successful business because when your business is successful local and State economies benefit as well as you do too. Marketing does not have to be expensive and you have to market to move a product or service. Having a website is important to get the word out beyond your community. If you are operating within the Darrington School District you can have a webpage in our www.discoverdarrington.com business directory by being a current member of Darrington Strong, Inc. or you can set up your own website and we'll be glad to link with you. Darrington Strong is all about supporting our community! A website can be a lot more successful if it coexist with social media to drive attention to your site. It is very helpful to create a marketing mission statement to help you keep good focus for promoting your product, business or service. See the side bar for affordable printed materials, suggested free websites & social media. It is true that websites work for your business but only if you work your web presence. Marketing can be fun so let that dream you have work for you! The more you promote what you are offering the more people will know about you. 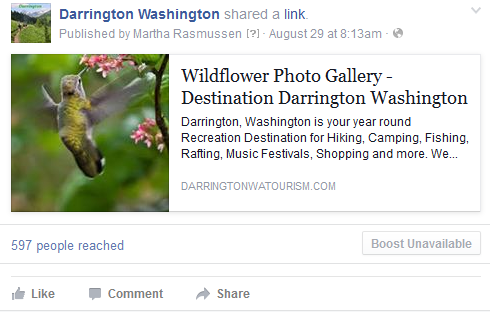 Enjoy your Darrington dream & Darrington Strong is only an email away working together to build a thriving community!